It just takes 3 years to double your money in gold. Don’t be surprise, this has happen again. 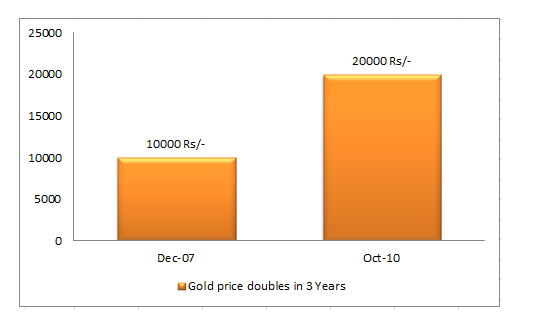 If you look at historical price of gold domestic price of gold in India were at Rs 10,000 per 10 gm in December 2007. 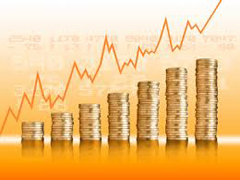 Setting record gold price has cross level of Rs 20,000 in October, 2010. 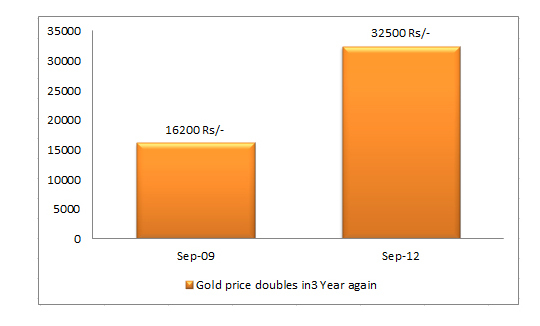 It took just three years for the gold prices to double in India. Most of us believe that history never repeats but this time we are wrong. Gold has again beat all asset class and given wonderful return. Gold was quoting Rs. 16200 in September, 2009 after 3 years in September, 2012 it is quoting Rs. 32500 it doubles again. Safe haven gold is treated differently in India. As it is not manufactured in India we import gold and hence gold price varies as per international market rate and dollar value. Gold has reached highest level of 1900 $ in international market on 23rd August, 2011. At that time gold was quoting Rs. 28,600 in Indian market. Right now gold is quoting 1730 $ in international market but gold is quoting Rs.32,500 in Indian market. Gold has reached to another peak as dollar has become stronger compare to rupee value and investment demand is increasing every day. Before 2 years dollar value against rupee was Rs. 45/- which has reached to Rs. 55 /- now a days. Change of just 10 Rs/- per dollar has caused this heavy impact on gold price. Apart from this global slowdown and economic crisis in euro zone is forcing hedge fund and other investor to invest in gold. Physical sales demand in gold has been negatively impacted by this price rise. But it looks like investors are still pumping money in GOLD ETF. As monsoon condition has improved and festival season is about to begin with Navratri and Diwali we may see fresh buying in gold jewelry. Gold prices still look bullish as the factors like investment demand, dollar weakness and the poor economic outlook for the US and Europe, that have been triggering the price rise still hold good for the coming months. Now we have to see that this favorite shining yellow metal of investor will outperform again and doubles your money in 3 years or not. Wait and watch gold price don’t be surprise if it doubles again from Rs. 32500/- to Rs. 65000/- by 2015.